The Fourth Industrial Revolution (Industry 4.0) refers to the current era of convergence between automation and data exchange technologies in manufacturing. The top five trends that will characterise automation technology in this new age of ‘smart factories’ include the Industrial Internet of Things (IIoT), augmented reality (AR), mobile access to machines, reprogrammable robotics and industrial automation security. Automation, in a broad sense, refers to the integration of mechanical systems with electronics and embedded firmware. It is implemented to facilitate standardised, reliable production systems, effective monitoring, reduced waste and optimised production processes. During the paradigm shift of the digital age, the IIoT will develop these aspects of manufacturing by enabling accessibility to greater amounts of information at greater speeds than were possible before. The IIoT is the convergence of information technology (IT) and operations technology (OT) systems in ways which give operators access to the information (Big Data) they need to make more informed process related decisions. Big Data mitigates risk and improves efficiency. It builds a connected enterprise to improve productivity and helps workers to develop new skills. Today’s reality indicates that software, sensors and controls are at times outdated and difficult to upgrade. At the same time, there is limited integration between internal systems (plant data sources) and external systems (ERP). Tomorrow’s vision shows how through communication, sensors and operational technologies will work as an integrated system along with IT. Standard, fast software development techniques will be used to create intelligent industrial products in a common sensing and control architecture. Research indicates that these improvements in the industrial sector could yield revenue growth of up to 70% and an improvement in workforce productivity of up to 30%. Building Android and Windows apps are some considerations for mobile access. Waiting for a third party to develop an app for a mobile device could take time, and if not skilfully coded, the result could be poor performance. Factors like time, complexity and expense result in a native mobile version of the app to be more productive, thereby optimising this process. At times a single device sacrificing performance is optimised to run the app on a website geared for several mobile devices. In terms of IIoT, the Siemens WiFi ETH-MPI DP S7-300 Ethernet communication adaptor module CP343/ 5611 can be incorporated with the S7-1500, S7-1200 and ET 200SP controllers or S7-1500 and ET 200SP CPUs running V1.8 firmware or S7-1200 running V3.0 firmware, to facilitate mobile access. Augmented reality is the real-time integration of digital information into the user’s environment. Unlike virtual reality, AR uses the existing environment and overlaps new information, by written application, in special 3D programs. AR applications incorporate GPS, machine vision, and object and gesture recognition technologies. An AR system provides a mixture of real and virtual images in the user’s interface unit, e.g. a cellphone. The objects of the real world observed by the user are sent to a processing system, e.g. a computer, which generates the virtual object. The real and virtual objects are synchronised in a way that produces a perception of observing a common graphical representation. The type of industrial system determines the approach to be used in terms of the resultant output. Displays, monitoring systems, interaction devices and computer systems are the primary components of AR. The display is crucial to provide a representation of the system. Accurate location in real-time is the responsibility of the monitoring system, which aligns the virtual and real objects. The interactive device provides a physical interface for the user whilst the computer system is responsible for generating the virtual objects. • An adjustment must be made to a machine: visually direct workers to the adjustment port. • Worker is in an unfamiliar environment: provide contextual visual instructions. • Worker spends time searching for data on equipment they are repairing: identify the equipment and display the data. • Technical resources are required to evaluate an unplanned incident: provide communication tools and a real-time ‘snap shot’ of the equipment. The primary driver for manufacturers is the need to embrace automation to remain commercially competitive. Automation can be extremely cost-effective on a scale from SMMEs to large factories. In terms of flexibility, manufacturing processes can be adapted to different options from a single product in a given operation, e.g. a two-position gripper functions on two axes to offer flexibility and rigidity. Robotic effectors adapt to different sizes, shapes and textures to offer optimal performance and introduce cells or modules to facilitate flexibility, e.g. incorporate a ‘pick-and-place’ function but keep the remaining line unchanged. There is no waiting time for operators as the robot is programmed to perform basic repetitive operations, and can be reprogrammed to perform intermediary ones. In the long term, robots are less expensive than manual labour and can be programmed for specific tasks and then reprogrammed to change tasks, thereby increasing accuracy and preventing bottlenecks. A 2014 survey by PWC and Zpryme showed that 27% of respondents planned to implement robotics in assembly processes, 26% in machining, 22% in dangerous tasks and 16% in warehousing, within the next three years. Alongside all the potential benefits offered by Industry 4.0, industrial automation security is one of the biggest challenges. 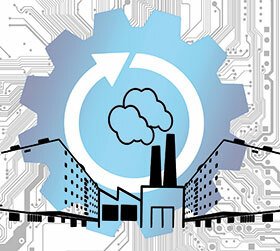 Manufacturers will have to remain vigilant as their networks permeate down from the top floor to the shop floor. Any new device on the network is a potential access point for hackers and this will need to be addressed without compromising the high resiliency required by OT or the interconnectivity and compliance required by IT. Viable new security models must be developed to work with both new and existing systems. In terms of security threats: remote code execution (RCE) vulnerabilities enable arbitrary code to be remotely executed in a target system; denial of service (DoS) vulnerabilities enable DoS attacks to be carried out remotely; code injections include vulnerabilities that enable SQL additions to be performed remotely. File manipulations enable various file operations to be performed remotely, while user access account manipulation enables attacks on legitimate user data to be performed remotely. In addition, ageing operating systems and vulnerable technologies add to the posed security risks.